Let me be honest with you. I generally hate books intended for a popular audience written by gaijin (foreigners, or non-Japanese). Bruce Feiler’s Learning to Bow (2004), Peter Carey’s Wrong About Japan (2006), and Michael Zielenziger’s Shutting Out the Sun (2007) spring immediately to mind. My complaints concerning books of this kind are myriad, but they basically boil down to a few specific points. Namely, the authors have never formally studied Japan, they’ve never spent any significant length of time in Japan, and they don’t speak Japanese. As a result, their theories are based on misinformation and mistaken assumptions, if not on pure ethnocentrism. “Wrong about Japan,” indeed. I am excited to tell you that this book is different. Not only is it meticulously well researched, detailed, and accurate to a point at which I would not have doubted a Japanese name on the cover, but it is also perhaps the most outstanding work of English language fiction that I have read this year. Schwartz’s novel brought me, a literary cynic, to tears on more than one occasion, and its emotional impact stayed with me long after I had closed the book for the final time. 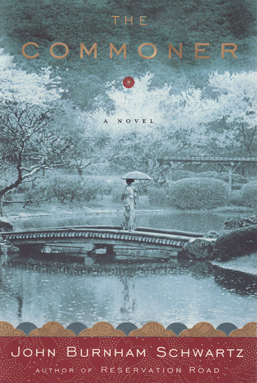 The Commoner is a fictionalized account of the life of Michiko, the current Empress of Japan, and the entrance of the current Crown Princess, Masako, into the royal family. Schwartz has renamed Michiko “Haruko” and Masako “Keiko,” but the parallels between his fictional princesses and the lives of the two real-life princesses cannot be mistaken. Even though the various triumphs and tragedies of these two women has been well publicized by the media, the Japanese imperial institution has put up an iron wall of silence behind the moats of the Imperial Palace in Tokyo, preventing the thoughts and stories of its residents from ever reaching the public. Schwartz’s novel is an attempt to understand the lives and emotions of the Empress and the Crown Princess lying dormant underneath their carefully-managed public facade. I’m not going to spoil the plot, but I have to let you know that the ending of this book is amazing. If the beautiful prose and delicate characterizations, evident from the first page and only building in intensity, weren’t enough to hook you, the novel’s climax definitely makes The Commoner well worth the read. Oh, god, “Wrong About Japan” was awful. Not only were his assumptions and such totally off, but the book was just horrendously organized. Spending two or three chapters talking to the makers of Blood the Last Vampire, and another one talking to a swordsmith, does not constitute an exploration of Japan. I was surprised to discover, however, that I really enjoy his fiction writing. Or at least the one novel of his I’ve read, entitled “My Life as a Fake.” The story centers around an English (Australian? I don’t really remember) poet who’s basically “gone bamboo” and vanished to Kuala Lumpur, and an Englishman who’s been looking for him. That’s really interesting. I know that it was Carey’s status as a novelist that won him the interviews he botched (why did he get to meet Miyazaki? ), but I’ve never actually heard anyone say anything about his novels. I will take you up on your recommendation and check out My Life as a Fake. Thank you!